I’m active on a Facebook group for UX/UI Design Feedback. In all fairness it is a UX and UI feedback group and not a straight UX feedback group. Still most of the people posting their mock-ups and projects ask how those project can be improved from a UX standpoint and how they can be made more usable, but they only post images or site links and no information about their users. So I came up with this analogy that I think demonstrates pretty well why knowing who your users are and how they might use something is important. 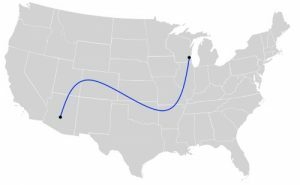 If I were to post an image of a map with a blue line going between two points and ask you if it is a good route to take, what would you tell me? Can you tell me if it is a good route if you don’t know my method of travel? That blue line could pass right through a mountain range with no roads, which would be fine if I was in a plane, but impossible if I was in a compact car. What if you don’t know my time frame and when I need to reach my destination? If I need to get there by a certain time, that could be a horrible route, but it could be perfectly fine if I want a scenic route with lots of things to explore along the way. What about who is travelling? Could that route be just fine for me as a single adult traveler, but not so great for a family with small children in the car? What if instead of small children there are older people with disabilities in the car with me? Or both? Do we have pets travelling with us? Do you know our budget? Are we camping to save money and if so are there places on the route to do it? If we aren’t camping and it’s a long route are there hotels along the route and do we have enough money to stay at that many hotels? Am I choosy about my lodging, will any roadside motel or inn work or do I prefer to only stay in 4 star hotels? Assuming that you can’t read my mind, unless you just get lucky, there is no way you can tell me if that blue line is a good route for me or not. You might be able to tell me if it’s a dangerous route and be able to suggest a less dangerous route. That is different than telling me it’s a good route though and it’s very different than it being the best route for my needs. Whether you are giving somebody feedback or designing something yourself, you have to have these kinds of details available, you have to understand the way a user is going to use what you are designing.